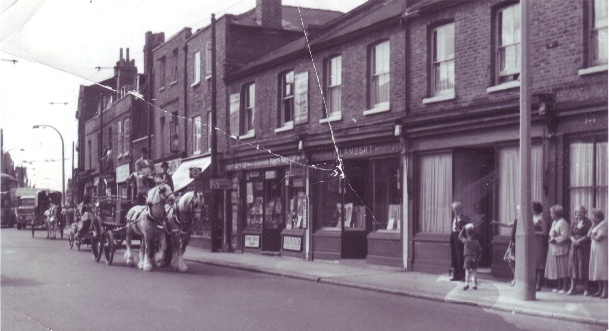 Diane Lockie has provided this first photo which she thinks dates from the 1960s and shows part of the parade passing 241 to 245 High Street. The name above no. 243 is F. Lambert: a 1940 directory includes Frederick Lambert, boot repairer. Next door at 242 the photo shows a tobacconists, advertising Players Navy Cut. The name 'Druce and Smith' at no. 239 is just visible: they were bakers. Lynn Christison, another Newman descendant, sent this photo in March 2013, it appears to be from the same event. The butchers at 246, next door to the Newman shop, are S.C. Penn..., a check on ancestry of the phone directories for the early 1960s and the 1952 electoral register have not produced a name that matches.